It's now the end of January and the Holidays are officially over and with it goes the frenzy of sales. Sort of... While Black Friday and 12/26 sales are behind us, that doesn't mean you can't get a good deal, so don't think you now have to buy everything at full price. As a matter of fact, unless you're buying a very high end luxury item, specific brand, or need something in a pinch (there are even exceptions to all this) you should never buy anything at full price. Having worked in the retail industry for umpteen years, trust me when I say, save your money, you can always get a deal!! Here's a chart outlining the best times to shop for certain items. January- Stores need to make room for spring goods so the mad dash to get rid of anything winter is on. You'll find very deep discounts on winter items- boots, coats, scarves, gloves etc. I will say, at this point it's all been picked over but, you can definitely find some great deals on winter items. February- Spring goods start hitting stores and it's a slow time for sales. 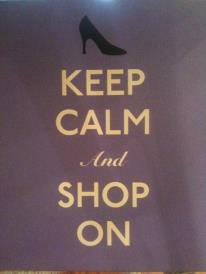 But, now is your chance to browse all the new spring looks and note down what you want to buy when the sales start. If you're in the NYC area, during this "down time", why not go out and catch a Broadway play. It's "off season" and you can get a really good deal on theater tickets now. March- Planning on travelling for spring break and realize your suitcases have seen better times? Well, you're in luck, because it happens to be the best time to get a great deal on luggage. Also, some of that spring merchandise will start going on sale, so start looking for those coupons and take advantage of One Day Sales. April- Remember all that spring stuff you saw in February and held off on buying for a better deal? It's deal time and just in time for the start of spring! Goods that came in in February are making their way to the clearance racks. Best bet would be to shop early so you're not left with picked over merchandise. Also, summer goods start coming in now, so while you're shopping for spring clearance, browse summer merchandise as well. May- Summer is in full swing in stores (even though it's not officially summer yet). Summer deliveries are out with big sales starting, especially around Memorial Day. June- Tired of looking at your chipped dishes or want to complete your incomplete dish sets? Now is your time to do it. With wedding season in full swing retailers have lots of home products on sale, even those fine china pieces that you keep wishing would go on sale. July- Let the summer clearance begin!! More aptly, time to buy summer SANDALS! Summer shoes and clothing are on sale to make room for early fall / back to school merchandise. August- Summer clearance is still going on and now true summer items, like bathing suits, are heavily discounted. This is the time to stock up and save for next summer. The family (Mom, Dad and kiddos) will always need shorts, tees, bathing suits etc. so buy them a size bigger (for the kiddos) now while they are on clearance, and you'll be all set for next summer. Back to school items start hitting stores, so see what's out there, but hold off on buying them. September- Labor day sales are the best time to buy outdoor furniture, pool stuff and all "summer activity" things. Again, buy them now and save them for next year. October- When is the best time to buy back to school stuff? During back to school! Fall merchandise is on clearance to start making way for all the holiday goodies. You can get amazing deals on denim end September / beginning October. November- And so begins the Holiday shopping season. I have three words for this month- Black Friday Sales, 'nuff said. December- Sale, Sale and more sale. The best day to shop all year is 12/26 when all off the post holiday sales start. Once again, stock up and save on winter items or if there is something that you wanted to buy and can wait till after the holidays, now is the time to buy it. Take it a step further and plan to shop on Thursdays, it's the best day of the week to get a good deal since most retailers start their weekend sales on that day. Hope this all helps you save money and find the best deals! What are some of your amazing deal shopping tips? Posted on January 21, 2014 by Monisha Kapur and filed under Tip Tuesday and tagged shopping deals save money best deals shopping.